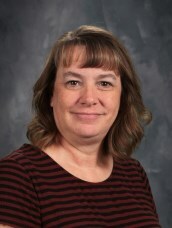 Julie Combs has been serving Calvary as the bookkeeper for both the school and church for the past nine years. Julie grew up on the southside of Indianapolis attending Calvary Lutheran School herself from first through eighth grade. Julie started dating her husband, Doug, during high school. They were married after she graduated from ISU with a BS in Elementary Education. Julie and Doug have been blessed with five boys. Attending the boys sporting events, reading and walking the family dog, Freyja, are some of her favorite hobbies.